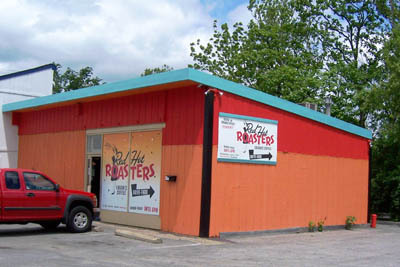 We’ve traveled through Columbus Ohio on I-71 many times without exploring what coffee roasters might be available simply by taking a short detour off the freeway. 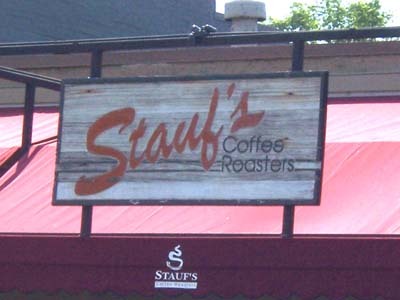 Well, enough is enough, so I went online and picked Stauf’s to be our first Columbus coffee roasters’ visit. Stauf’s (www.staufs.com) is located at 1277 Grandview Ave. Getting there we also passed our favorite peanut butter producer without knowing we would. 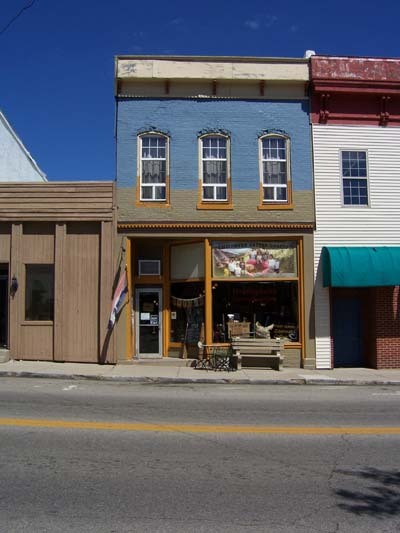 Stauf’s is located on a nice little street with a number of restaurants and shops nearby. There is a patio area with tables and chairs right in front of the shop. You are greeted by the smell of coffee as you walk in. To your right is their flavored coffee and there is a lot of it. I’m not a flavored coffee fan but just a little walk and turn to the left and there is the coffee! We were also greeted by a helpful salesman by the name of Andy. He offered assistance and information and was not pushy. He answered all of our questions and when asked he told me what his personal favorites were. We interacted with two other salespeople who were equally as friendly and helpful. As we made our way past all of the coffee beans we went to the counter to order a cup of coffee. Kim and I both ordered a dark roast called Baba Budan. The young man at the counter asked if we would mind waiting because he had to make a fresh pot. We gladly assured him that we would not mind waiting for a fresh pot of coffee. I bought a cookie and ate it as we waited for the coffee. There was a lot of activity and you probably couldn’t do much reading or studying there. But it is a good place to have a cup of coffee and conversation. Doesn’t coffee seem to taste better when you have it and talk with someone? There is food you can purchase too and it really does look like a good place to go to eat and drink coffee. We ordered the coffee to go and when it was ready that is what we did. The only negative is that the coffee was so hot you could not hold the cup long even with the sleeve. We may have even burned our tongues a little because of how hot it was. But it did have a good bold taste that lingered after you swallowed. We would definitely get it again. The staff is friendly and helpful and the coffee is good. We would definitely return. 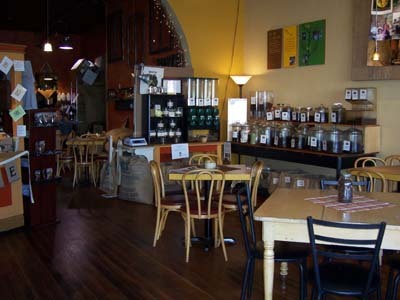 We’ll be looking for other coffee shops to visit and review on our travels. Until next time enjoy the coffee and the conversation. My wife and I recently stayed in Nanuet, NY while visiting our youngest son. 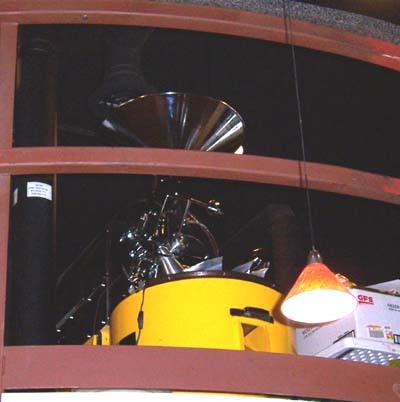 Before going I went online to find coffee shops, especially those that roasted their own beans. Let me say that the pickings were slim. One I found that looked interesting was in Tarrytown, but it was across the Tappen Zee Bridge on the east side of the Hudson River. Having been in and through this area a few times I did not look forward to going across the bridge and fighting traffic. But my son thought his mom and I would like it and that traffic wouldn’t be that bad and he would drive. How could I resist? 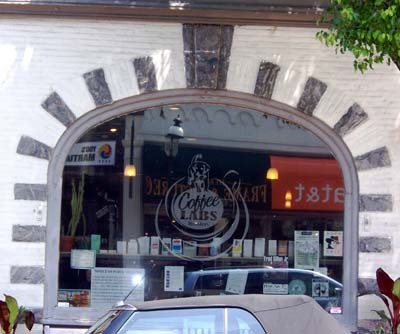 So we went to Coffee Labs Roasters (www.coffeelabs.com) 7 Main St. Tarrytown, NY and are we glad we did! We got there around noon on a Friday and we had to look for a parking place. When we found one we had to walk up the street a few blocks and we enjoyed looking at all the shops. You could smell the roasted coffee outside the shop and we were looking forward to going in. The staff was very friendly and helpful. They answered all of our questions concerning their coffee. We purchased two House Blends and one Peruvian decaf. We took pictures too. 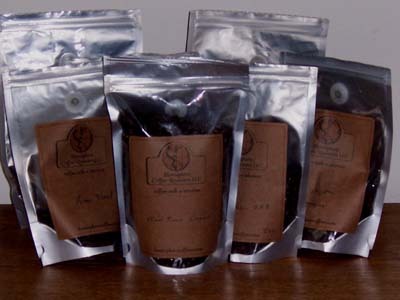 The House Blend is a full city roast and has a nice aroma, smooth taste and nice feel in your mouth. I drank mine black and really enjoyed it. My son is not the coffee drinker that me and Kim are so he put cream and sugar in his and said he liked it. Kim really liked the decaf which is a full city to full city plus roast. She drank hers black and said it had a very good taste, almost a sweet flavor and slightly acidic. They also have a Kyoto style drip brewer in the shop. I have seen them online but had never seen one in a coffee shop before. 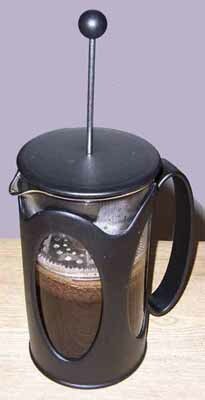 It cold brews coffee at about 2 drips per second and takes roughly 18 hours to brew 25 cups. They let us sample an Espresso Roast (our favorite) and their Witches Brew (it had an interesting flavor). I’m not really a cold coffee drinker but if you are I suggest you try it. 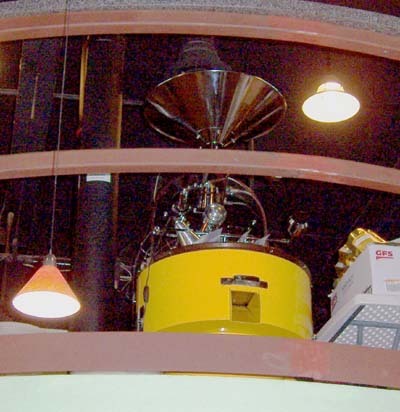 The head roaster is Kurt and he really understands coffee beans and roasting. The coffees we tried were very good. 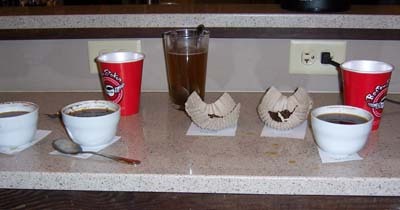 If you are in the area you should make the time and effort to go to Coffee Labs Roasters (www.coffeelabs.com), you will be glad you did. We will return the next time we are in the area. We left with three bags of coffee to brew at home, drink and review. As we were heading back west over the bridge I wanted to open the bags and smell the beans. I opened the first one, smelled the beans and was handing the bag back to my wife when my son said, “man that coffee smells good!” That was the Brazilian Decaf. 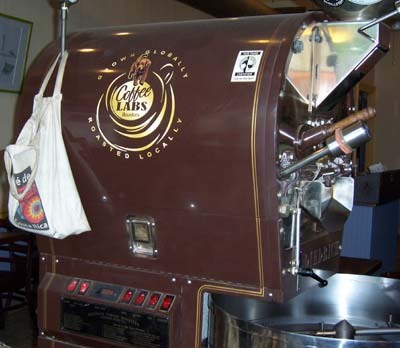 Enough for now, come back in a few days to read our first review of the Coffee Labs Roasters coffee. 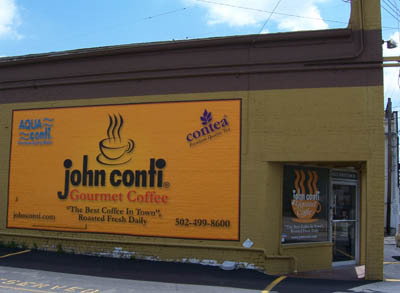 While driving through Danville Kentucky I spotted a coffee shop on the corner. Kim and I were hoping we would find a coffee shop to stop at. We did not want fast food coffee, gas station coffee or donut shop coffee. 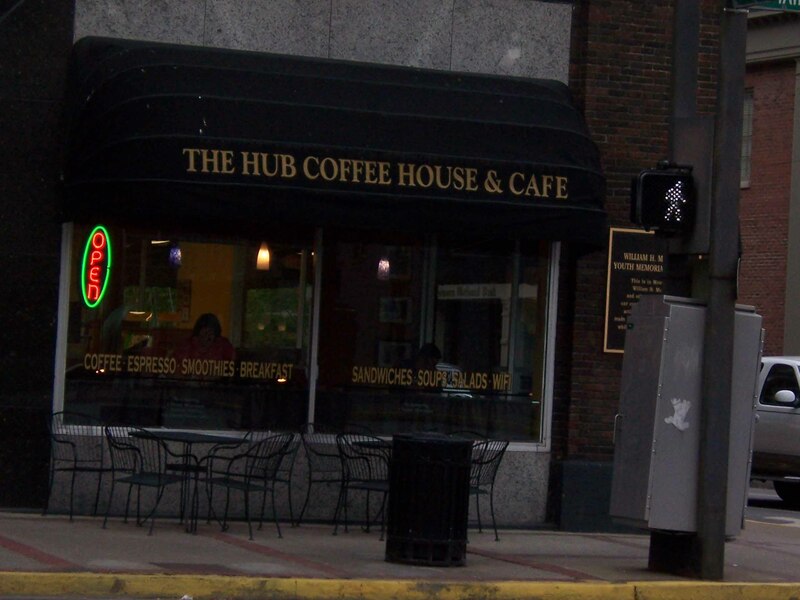 We parked on the street and walked back to The Hub Coffee House and Café www.thehubcoffeehousencafe.com. It is connected to Centre College Bookstore. She finally asks us if we wanted anything and I tell her she can finish helping the young man. She tells me its o.k. we were just talking. My wife and I tried to ask her some questions about the coffee they serve (Sunergos, Higher Grounds and Stauf’s) and about the coffee shop. She either didn’t know how to answer our questions or she didn’t want to talk with us. 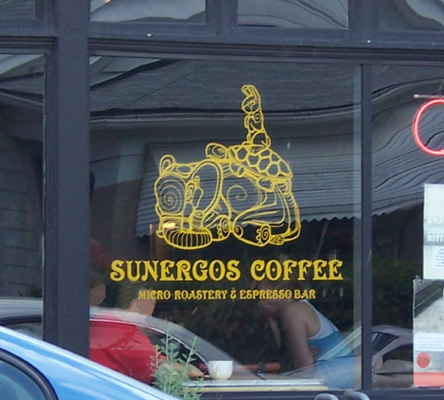 Since we both like Sunergos (and we have reviewed them before) Kim ordered Higher Grounds medium roast Mexican and I ordered the H.G. dark roast called Fresh Water Land Trust. Both coffees were good. My wife drank hers black and really enjoyed the flavor. It wasn’t too bold, and had a slight citrus flavor. I got the bottom of the pot and it wasn’t that warm. She heated it with the espresso milk scalder. I thought she would offer to make a fresh pot. The dark roast wasn’t too bold and I told Kim I would like to try a fresh pot of this coffee. We also ordered a chocolate chip sandwich cookie and it was a little too sweet. You may wonder why we stopped again on the return trip. 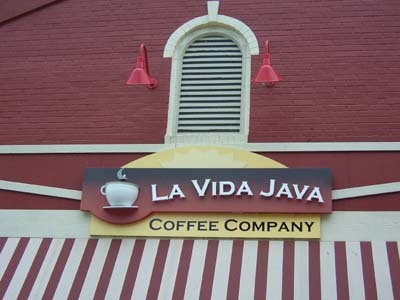 Well I believe everyone deserves a second chance and we did not see any other coffee shops, anywhere. Kim likes a flavored coffee at times so she ordered Stauf’s Chocolate-Orange blend. It had a hint of bittersweet chocolate and slight orange taste. She liked it a lot. 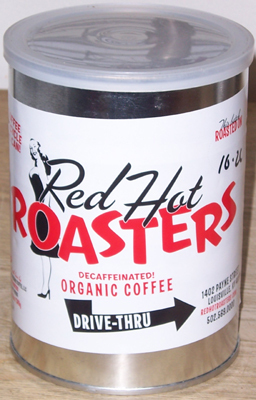 I ordered a Higher Grounds medium roast called Red Ribbon Blend. It was smooth and light in my mouth and was a bolder taste than I expected from a medium roast. I drank it black because it tasted so good. The sales person who waited on us was different and she seemed to be interested in talking with us and serving us. The dark roast was old and she offered to make a fresh pot if we wanted to wait. This was totally different service compared to the day before. We were asking her questions about the coffee and the shop and she tried to answer them. She even asked us to talk with the manager; I think her name was Natalie. I’m not sure if service there is always hit or miss, but based on my first time there I was not impressed. The second visit was a better experience. At the Leader’s Retreat one of the topics we discussed was the importance of customer service. The Hub needs to improve on customer service. They need some consistency in their staff. 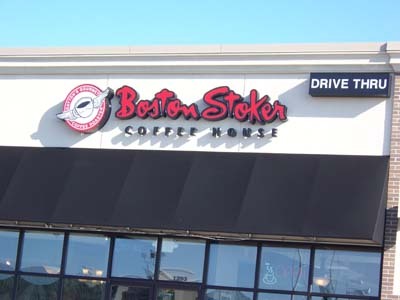 They seem to have great coffee selection, some good sales people, and a manager who seemed to care about customers. A little training and they could be a very good coffee shop. We are looking forward to our next coffee shop adventure whether it’s good or bad because we do it together.